While I was working on the facelift for the kitchen I came up with the idea of creating some quick wall art for a specific wall. I had no idea what to create but I wanted something to cover a phone jack hole. Yes, I could have just repaired the drywall but I will need to tear the drywall out, whenever I get around to a complete kitchen renovation. Easier at this point to just cover it up. While working on the backsplash I remembered I had some leftover wallpaper from my Master Bath shower area renovation. 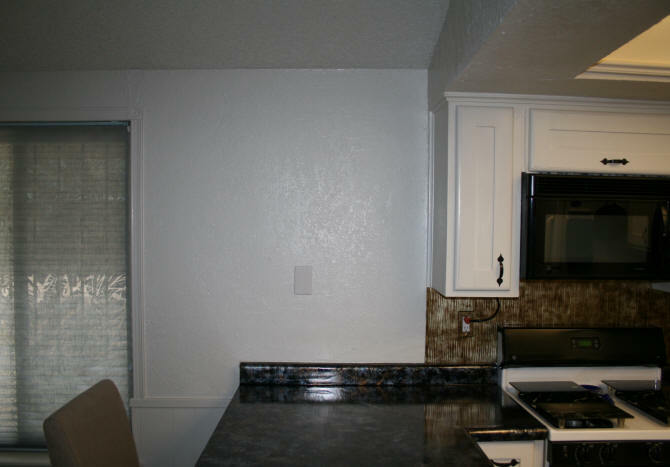 I ended up using the wallpaper on this wall to soften the starkness of it. It also covered up the phone jack hole. Wallpaper now on this section of wall. No more "visible" phone jack hole. While I was waiting for the various stages of the countertop to dry during my countertop facelift, I came up with the idea of the artwork. 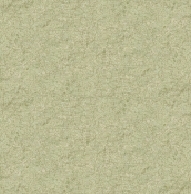 What I had on-hand was a bunch of textured art paper that I have used for cut paper collages in the past. 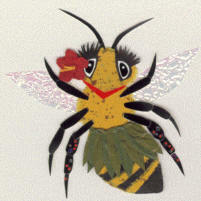 See Hula Bee to the right. I wanted colors that would match my new countertops. 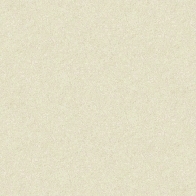 I did happen to have some black and bronze colored papers. Now to decide what to make. I just liked these designs. 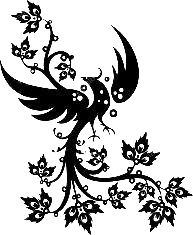 They were simple yet intricate enough to be a challenge cutting out. This project in itself, would be a great project for kids to do. Giving a household some artwork other than the crayon drawings stuck on the refrigerator. Like taking profile head shots of everyone in the family and make head silhouette art, for example. 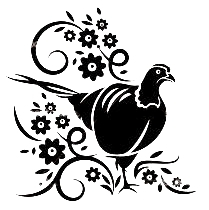 After deciding on the bird / floral designs I wanted to use, I needed to figure out what size I needed, to cover the space on this wall. I was not worried about standard frame sizes. I just wanted a series of art pieces that fit my space. - Two 12" x 18"
- Two 12" x 12"
After laying out the art paper all over the floor and furniture in my living room, I came up with the combination of papers I liked. After cutting the background paper to the the sizes I wanted, I printed out the designs at the scale I needed. 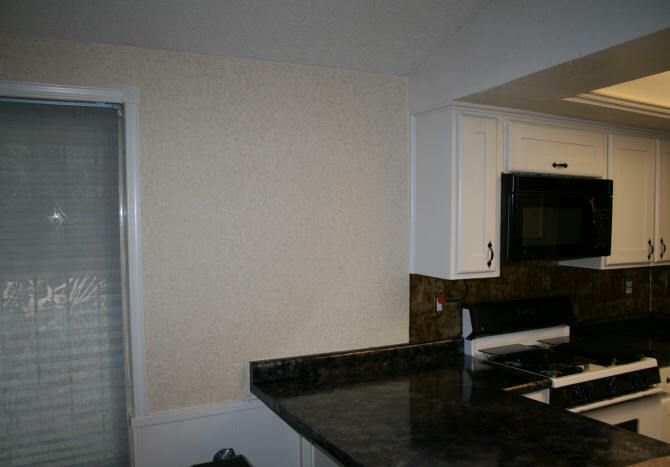 If you are printing out a larger image than your printer paper, tile your printouts. Most graphic programs allow you to tile your printout if it is larger than your paper. You just need to tape together the tiles printouts to get the larger image. I then traced the image onto the paper using a window for back light. 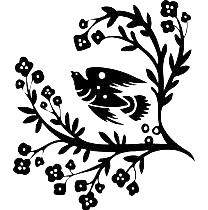 For black paper, if you use pencil, you can see your tracing. After the images were traced, I cut them out and glued them with regular white glue (Elmer's) onto the background. I only needed enough glue to make them stick. I removing any excess glue before it dried. It took two days to cut and glue all of the images for the five art pieces. 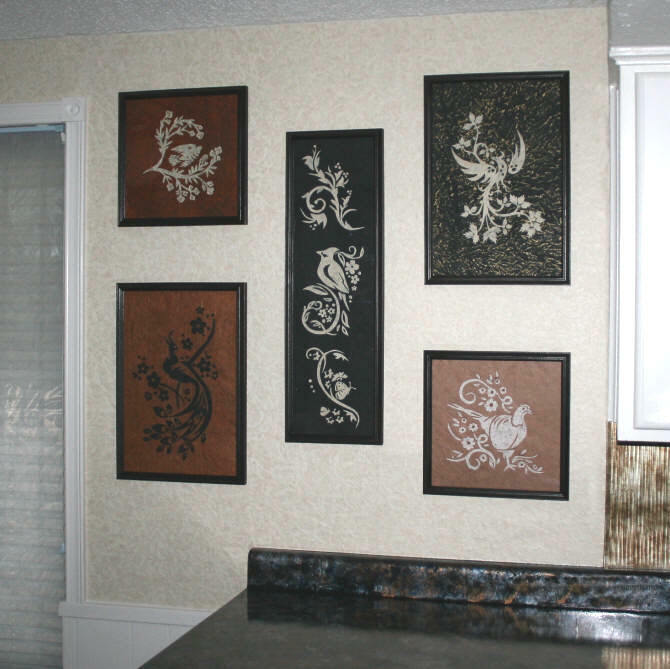 Before I placed the wallpaper on the wall, I pinned the images up on the wall to see how they would look. See photo below. The images looked good where I had placed them. However, I would need to frame them. I also did not like one of the images and changed it later. Frames are easy enough to make, but I was too lazy at this particular time to buy a bunch of moulding, make all of the 45 degree miter cuts, and glue everything together. So I looked online for an inexpensive framing option. I was pleasantly surprised when I came across a website that had frames at a really low price. Lower than the cost of driving to the hardware store and the time to cut and put everything together.....if you believe that. So they get a good review on my website!!!! The key to finding frames that are as inexpensive as I found them? Go straight to the outlet or sale items on the website. I planned to frame my artwork myself. 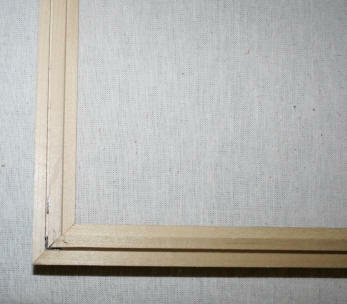 You can order matting, acrylic, and all the other framing items you need when you order your frame. This however will add to the cost. 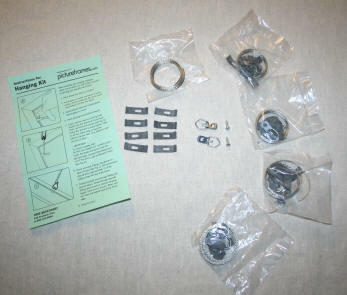 The hanging kits I received, came with the frames I ordered at no extra charge. Grand total for five frames plus the $11.95 shipping and handling, was $30.80. That comes out to only $6.16 per custom sized frame. This is a whole lot cheaper than what I could have bought ready-made at a store OR the materials, time, and labor of making it myself. The only drawback, was waiting for the frames to arrive. I ordered them on Nov 21 and received them on Dec 3, 2015. I selected the cheaper ground shipping. 12 days. For this great price, heck, I had no problem waiting 12 days. They promise to ship 3-7 days after the order is received, which they did. The frames were received assembled. The shipping packaging was done very well!!! 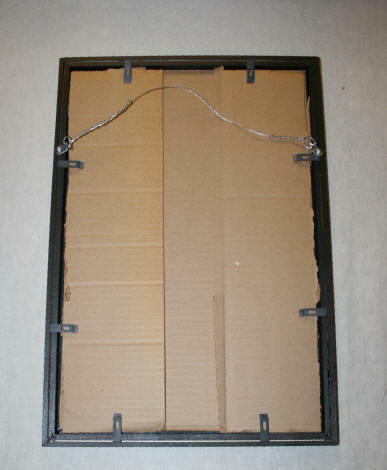 The frames were strapped to the center of the box. So if the box was dropped on a corner, it would not touch the frames. The frames were also wrapped in bubble wrap before being strapped in. Basically, a truck would have to run over the box to cause any significant damage. Each frame I ordered automatically came with a hanging kit. To accommodate the retainer clips they provide, there is a groove routed into the back of the frame moulding. For the "glass" on the frame, I had left over polycarbonate shelving liner that I had used on my window at the front entrance which I cut to the size of the artwork. The only problem with the polycarbonate is that there will be a glare when the lights hit it. I can live with this. I used a large cardboard box, cut to size, to make the backing of the artwork. Since I ordered the frames unfinished, I painted them myself. 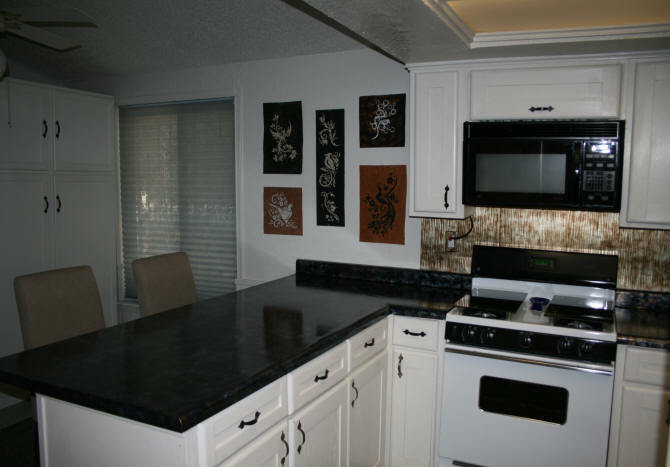 I had thought of painting them to match the countertop, since I had leftover paint from that project. But decided not to, in case I moved the artwork someplace else. I did use the black countertop primer to prime the wood. Then I spray painted the frames with oil rubbed bronze colored spray paint. Before painting them, there was a little bit of sanding to do on a few rough spots. Took a few minutes. 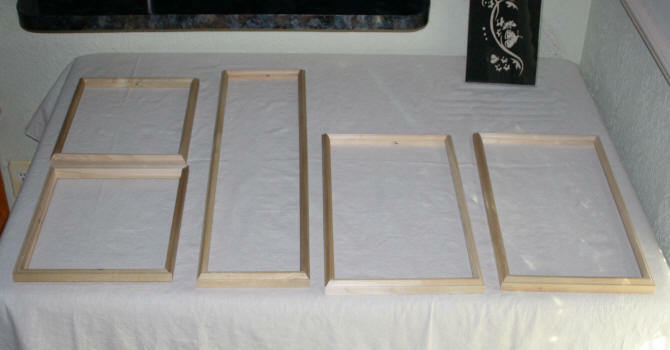 After the paint had dried on the frames, I was ready to start framing. Since everything was already cut, it was just a matter of putting it together. The clips that were provided with the frames worked great. However, my cardboard was not thick enough to fill the space so I put some scrap cardboard I had on-hand under the clips to level it out more. Not pretty, but no one is going to see the back of the frames once they are on the wall. The D-rings screwed in easily on the frame and then I attached the hanging wire. After measuring carefully the hanging locations, the artwork was hung on the wall.